The Chess Association of Malawi hosted the 2015 Zone 4.3 Individual Chess Championships from April 17th to 26th in Blantyre, Malawi. 36 players of 7 countries were present for the event. In the Open section, 22 players from Angola, Botswana, Malawi, Mozambique, Mauritius, Zambia and Zimbabwe competed for the International Master title and the qualification to the 2015 World cup, the winner was the Zambian FM PHIRI Richmond with an impressive 8.5 pts over 9 rounds, full results. 12 ladies played in the women section, the winner was the WIM from Botswana MUDONGO Boikhutso with 8.5pts over 9, full results. Dear Friends, Under the auspices of the African Chess Confederation, the Chess Association of Malawi has the honour of inviting Zone 4.3 Federations affiliated to the World Chess Federation (FIDE) and in good standing, to participate in the 2015 Zone 4.3 Individual Chess Championships. 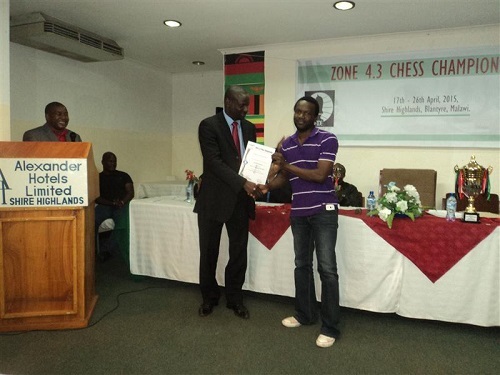 The Chess Association of Malawi has the honour of inviting all chess federations in Zone 4.3 that are affiliated to the World Chess Federation (FIDE) to participate in the 2015 Zone 4.3 Individual Chess Championships. The event will comprise an Open Section and a Women’s section. The Championships will be held from 17th April (arrival) to 26th April 2015 (departure) at Shire Highlands Hotel in the Central Business District (CBD) of Limbe (Blantyre) in Malawi. In accordance with FIDE regulations, the Zone 4.3 Individual Championships are open to all players from federations within the Zone 4.3 region which are affiliated to FIDE and in good standing. Federations will be allowed to enter a maximum of five (5) players in each category. The host federation reserves the right to field up to seven (7) players in each category and also hold a player in reserve; that can be registered in the event that there are an odd number of participants. Subject to agreement with the organizers, the Continental President may allow additional participants for the tournament. It is intended that the Championships will be played in accordance with FIDE regulations as a 9 Round Swiss System tournament. Time control will be 90 minutes for the first 40 moves, followed by 30 minutes for the rest of the game, with an increment of 30 seconds per move starting from move one (1). Swiss Manager will be used for the Championship, and players from the same Federation will not be paired together in the last round. Draw offers are not allowed before Black’s 30th move. The winner in the Open Section will be awarded International Master (IM) title whilst the winner in the Women’s Section will be awarded the Woman International Master (WIM) title. Other titles will be awarded in accordance with FIDE title requirements. The 2015 Zone 4.3 Championship is a qualification event for the 2015 FIDE World Cup in Baku, Azerbaijan. The winners in the Open Section will qualify for the 2015 FIDE World Cup. The tournament schedule is as follows but subject to some changes if need be. However any change to the schedule will be communicated during the Technical Meeting before the start of 1st round. The Chief Arbiter for the 2015 Zone 4.3 Chess Championships will be appointed by the African Chess Confederation President, Mr. Lewis Ncube. The Appeals Committee will consist of 3 members and 2 reserves chosen from among the participating Federations. All players, officials and accompanying persons from participating federations will lodge at Shire Highlands Hotel at Euros 50 per person per day (sharing) or Euros 65 per person per day (single room). This cost includes 3 meals (breakfast, lunch and supper). All payments related to board and lodging must be effected before the 1st April 2015, which will be the deadline for confirmations, or upon arrival (after confirming with the organizers). Players, officials and accompanying persons who arrive before the 17th April 2015 or depart after 26th April 2015 will be expected to arrange their own accommodation for the extra days or pay for the additional days at the tournament lodging venue, Shire Highlands Hotel. Participating Federations will receive free board and lodging for one player in each category. Important note: all payments must be made to the account of the Chess Association of Malawi as indicated in item 14, Bank Details or upon arrival subject to a specific request to the Organizers. If payments are not received before the start of the competition, players will not be allowed to participate in the tournament. In accordance with FIDE regulations both official players and additional players shall be required to pay FIDE fees of €70 per player. One player in the Women Category and one in the Open category from each federation will be recognized as official players while all others will be additional players. Fees must be paid into Chess Association of Malawi Account by 1st April 2015. The Registration Fee for each participating player is 100 Euros and must be paid into the Chess Association of Malawi account before 1st April 2015. Payments may also be made upon arrival, provided a request is made to the Organizers. Players whose Fees remain unpaid at the start of the Technical Meeting will not be allowed to participate to the tournament. Please note: Only Federations can register players. The Registration Fee for each official and each accompanying person will be 100 Euros. No refunds will be made for any player, official or accompanying person who fails to make it to the Tournament after paying registration or FIDE fees. Registration detailss for entries are appended herein; Federation officials must fill them in and return them to the designated Chess Association of Malawi officials on or before 1st April 2015 by e-mail to confirm entry. 1. Free Transfer (to and from) Chileka International Airport and Wenela Bus Terminus on arrival and departure. 2. Shuttle to various places in the city depending on the Shuttle schedule. There are two International Airports in Malawi, but you need to fly to Chileka International Airport. All traveling arrangements and costs to and from Chileka International Airport are to be taken care of by respective Federations or respective players participating in the tournament. Organizers will meet participants and accompanying persons at Chileka International Airport provided that full itinerary for each participant and their accompanying persons are communicated to the organizer in advance, (not later than 1st April 2015). 17.2 For delegations coming from countries requiring entry visas into Malawi, these can be obtained from Malawian Embassies or consulate offices in your country. we will issue an official invitation for delegations requiring the same for Visa processing. In some cases Visas may be obtained at the border of entry into Malawi but you will still need invitation letters. Entry forms must be filled by the respective Federation and returned to the host federation not later than 1st April 2015. This date is the registration deadline. Late registration attracts a penalty charge of 50 Euros. Players who arrive unannounced or later than 17th April 2015 will cover all their costs. We look forward to hosting all of you in our beautiful commercial city, Blantyre for a feast of exciting chess games. 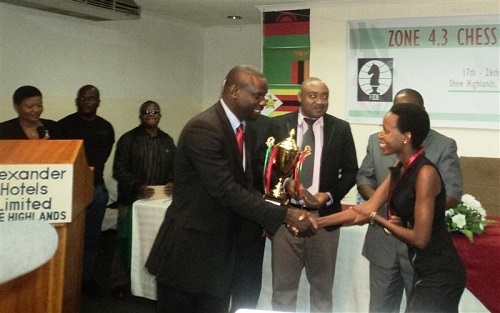 The Chess association of Malawi will host the 2015 Zone 4.3 Chess Championship in the metropolitan city of Blantyre from 17th April to 26th April 2015. Apart from the prize fund and all titles that will be awarded at this tournament, winners will have qualified to play at the world cup 2015 in Baku, Azerbaijan. This is therefore a rare opportunity that you qualified to be part of the competitors to the World Cup. 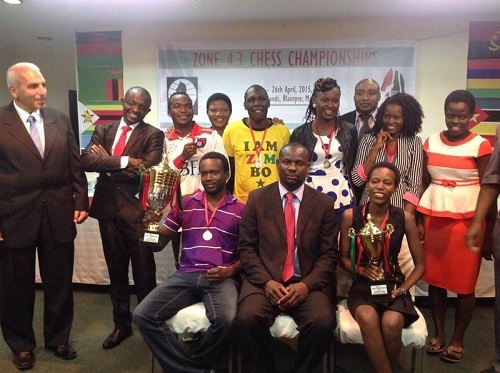 The Chess Association of Malawi, therefore, has the honor to invite all chess Players that qualified from the Central, Northern and Southern Chess Leagues, all invited active rated players and all players nominated to participate in the 2015 Zone 4.3 Qualifiers (Open and Women) to be held in Blantyre from 28 February to 2nd March 2015. The tournament will be held at Limbe Country Club in Blantyre. Accommodation will be on the account of individual players. 5.1 The Championship will be played in accordance with FIDE regulations on a 9 round Swiss System. 5.2 Time control will be 90 minutes for all moves with 30 seconds added on every move from move 1. 5.5 Draw offers shall not be allowed before Black’s 30th move. 5.6 All games shall be recorded by the players. 5.7 Cellphones and electronic devices will not be allowed into the playing venue in line with FIDE rules currently in operation. 5.8 Alcohol consumption is not allowed but smoking will be allowed except that Smoking may only be done outside the playing Hall. 7.3 The Tournament results will be submitted to FIDE for rating. Games shall be played according to the following tournament schedule. Should there be an inevitable change in this schedule, those changes will be communicated during the technical meeting before the start of Round 1. 9.1 The Chief Arbiter for the National Continental Championship 2014 Qualifier will be FA Gilton Mkumbwa. Chessam will provide light Lunch only on 28th February, 1st March and 2nd March. Accommodation shall be at the cost of individual players. All travelling arrangements and cost of travel to and from Blantyre shall be borne by participating players. A player who withdraws or does not play any round of the tournament after playing in round 1 without prior agreement with the Arbiter and organisers will have breached Chessam code of ethics and will be subjected to disciplinary action as led down in the Chessam statutes. CHAIRMAN’S SIGNATURE: ………………………………………………………………….. DATE: 2015/………/…………. Adrian Mhango and Ulemu Mbewe a student at Katoto Secondary School left the country through KIA on 30th November 2014 to fly the Malawi flag at the African Junior Championship that is going to take place at AAA Hotel in LundaSul, Angola. Adrian and Ulemu emerged Junior champios of the 2014 National championship that was held in Lilongwe recently in the open and women's sections resepectively. The duo are being led by their mentor, the Northern Region Chess League Chairman who was all praises for the team when they left for Angola. We want to wish the Juniors well. We could not pick more Juniors because of Financial constraints. The championship will run from 01 December 2014 to 10th December 2014. The Chess Association of Malawi has the honor to invite all chess Players that qualified from the Central, Northern and Southern Chess Leagues, all rated players and all players nominated to participate in the 2014 National Continental Championship 2014 Qualifier (Open and Women). The tournament will be held from 14 November (arrival) to 18 November (Departure) 2014 in Lilongwe, Malawi. The tournament will be held in Lilongwe at a Venue to be announced later. 5.2 Time control will be 90 minutes for all moves with no additional time. 5.7 Cellphones and electronic devices will not be allowed into the playing venue inline with FIDE rules currently in operation. 7.2 Winners in each section shall be awarded certificates and cash prizes that shall also be extended to their runners up, up to 5rd position. 7.3 All players that shall play in the National Continental Championship 2014 Qualifier shall be awarded certificates of participation. 7.4 The Tournament results will be submitted to FIDE for rating. 8.1 Games shall be played according to the following tournament schedule. Should there be an inevitable change in this schedule, those changes will be communicated during the technical meeting before the start of Round 1. 11.1 Registration fee for each participating player shall be MK1500 ($3) and must be paid to Chess Association of Malawi before 15 November 2014 at 8.00 AM. 11.3 No refunds will be made for any player who fails to turn up to the tournament after paying Registration Fees. All travelling arrangements and cost of travel to and from Lilongwe shall be borne by participating players. A player who withdraws or does not play any round of the tournament will have breached Chessam code of ethics and will be subjected to disciplinary action as led down in the Chessam statutes.